ECONET founder Mr Strive Masiyiwa has hailed Vice-President General Constantino Chiwenga (Retired) for visiting the company’s stand at the just-ended Zimbabwe International Trade Fair saying for the first time they felt accepted by the Government. This year’s edition of the ZITF came after the ushering in of a new dispensation led by President Emmerson Mnangagwa. 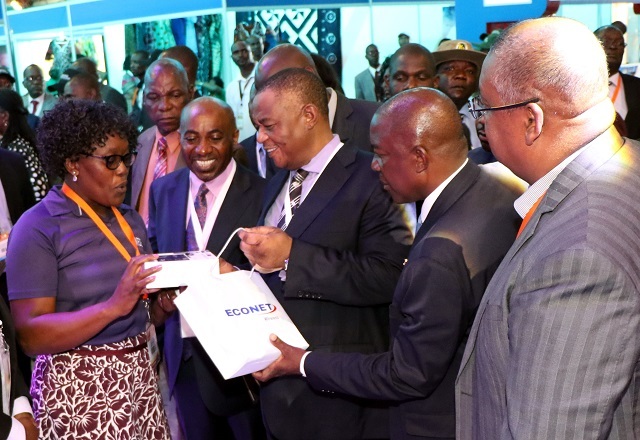 During his tour of exhibition stands at the ZITF last Wednesday, VP Chiwenga made a stop at the Econet Wireless stand where company officials briefly took him through a range of their products before handing him a Kwese TV decoder as a token of appreciation. Sharing his experiences with the old dispensation which he described as acrimonious, Mr Masiyiwa expressed gratitude to VP Chiwenga for visiting their stand. “A few days ago when the Vice President of Zimbabwe, Mr Constantino Chiwenga, visited our stand at a national trade show, you cannot imagine how appreciative we were of the gesture. Even though our company is the largest single employer of our fellow citizens, it was the first time we had felt accepted publicly by our own government,” wrote Mr Masiyiwa on his Facebook page. The telecoms tycoon, Zimbabwe’s first and for now only billionaire, took a leaf from President Mnangagwa’s message encouraging the Diaspora community by also urging fellow citizens living abroad to invest in the country. “With many of us in the Diaspora [living and working outside our home country] having left almost 20 years ago, it is perhaps not always realistic to expect our permanent return given that we have now built our lives elsewhere. “Nevertheless, it does not mean we cannot contribute from where we are. We can do much. Personally I will leave no stone unturned to help and support my country of origin; in my own way, even as I have always done. Respectfully, I feel I have also earned the right not to have others prescribe to me how and with whom I should contribute,” said Mr Masiyiwa. A number of people posted commending Mr Masiyiwa for hailing the new dispensation and preaching forgiveness. Before touring exhibition stands at the ZITF, VP Chiwenga had assured local and international investors during a business conference on the same day that Government was committed to maintaining credible and consistent policies to foster robust economic growth and development. He stressed the need to strengthen value chains in the economy through enhancing value addition programmes and promoting linkages between agriculture and manufacturing sectors to accelerate industrial development. VP Chiwenga said this included ensuring that both public and private sectors work together on funding research and development programmes critical for promoting efficient ways of producing goods and services.